Gemini Ganesan was a renowned actor of South India. Fondly called “Khadal Mannan” (King Of Romance), he did more than 200 films in his career, which spanned over five decades. He commenced his film career in 1947, with a role in “Miss Malini”. The actor featured in a number of blockbuster Tamil movies and acted in Hindi, Malayalam and Kannada as well. Gemini Ganesan dominated the Tamil film industry as a romantic hero for over two decades. He won several prestigious awards in his film career, which include Padmashree (1971), “Kalaimaamani” Award, MGR Gold Medal, Screen Life Time Achievement Award and Best Actor Award (Kaaviya Thalaivi). Born on 17th November 1920, Gemini Ganesan belonged to a middle class Tamil Brahmin family residing at Pudukottai, Tamil Nadu. He was the son of Ramaswami and Gangamma. Ganesan was highly inspired by his grandfather Narayanaswami, who took care of the family when he was a child. His beloved grandfather passed away when he was in the sixth class and later on, he lost his father as well. After the death of his father, Ganesan, along with his grandmother Bagirathi and mother Gangamma, moved to his aunt Muthulakshmi’s residence, in Madras. However, city life didn’t suit Gangamma and she decided to go back to Pudukkottai. Since Gemini Ganesan’s aunt Muthulakshmi was an ardent follower of Sri Ramakrishna Paramahamsa, she decided to enroll him into Ramakrishna Mission Home. There, he was taught Yoga and Sanskrit and made to read Upanishads, Vedas and Bhagvad Gita as well. He spent a disciplined life at the Home and became an expert in Yoga. However, he could not bear the agony of being separated from his mother, who was residing at Pudukkottai. Therefore, he returned to his native place and joined a high-school there. Later on, he joined Maharajah's College, located in the same place. However, he completed his graduation from Madras Christian College, Tambaram. Before entering the film industry, Gemini Ganesan worked as a lecturer in the Department of Chemistry, at Madras Christian College. Later on, took up the job of a production executive in Gemini Studios in 1947, from where the title “Gemini” was added to his name. He received an entry to films from the casting department of the Studio itself. 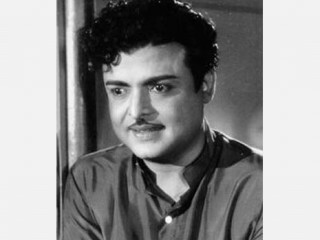 Gemini Ganesan made his debut in the Tamil film “Miss Malini”, in 1947. As a newcomer, he was unnoticed in his first few films. People started recognizing him as an actor only after “Thai Ullam” (1953), in which he played a villainous role. Gemini Ganesan was upgraded as a male protagonist in “Manampol Mangalyam” (1953), which was well received by the audience. The film proved to be a turning point for him. The huge success in the film fetched him the role of a romantic hero in the following films. Within no time, Gemini Ganesan came to be regarded as one among the three biggest names of the Tamil film industry, the other two being M.G.Ramachandran (M.G.R.) and Shivaji Ganesan. While Shivaji Ganesan excelled in films and M.G.R. continued to rule the industry by doing thrilling stunt scenes, Gemini Ganesan maintained the image of a yearning lover, with a lot of romance and a little action. From then on, he was regarded as the romantic hero of the Tamil film industry. Gemini Ganesan’s onscreen chemistry worked well with almost all the leading female actors during his heydays. He was cast opposite Savithri, Anjalidevi, Banumathi, Padmini, Saroja Devi, Vaijayanthi Mala, "Sowcar" Janaki, KR Vijaya, Devika and Jayalalitha in several hits, during the period of 1950 to 1970. Playback singers A.M. Rajah and P.B. Srinivos enhanced his screen presence by lending voice to his film songs. Apart from working in Tamil and Telugu movies, he worked in several Malayalam, Kannada and a few Hindi films as well. Towards the end of his acting career, Ganesan chose to act in television serials. There were three women in Gemini Ganesan’s life, although some rumors say that he had five wives. He tied the knot with Alamelu (a family woman) in June 1940. After divorcing her, he married film actress Savithri. Later on, he was married to Pushpavalli, another actress. Gemini Ganesan breathed his last on 22nd March 2005, at the age of 84, in his residence. He was diagnosed with Renal Failure and multiple organ failure, which were the major causes of his death. He is survived by eight daughters and a son. The renowned Bollywood actress Rekha is one of his daughters. View the full website biography of Gemini Ganesan.